Earlier this year I went to Bacolod for a short RnR and to see some good friends over the weekend. They played very gracious hosts to me and I am very grateful. Thanks friend M, H and pretty C. I had a very food-filled and fun stay with you guys. I can’t ask for more gracious hosts. I am separating my posts into 2 categories, the savories and the sweets. 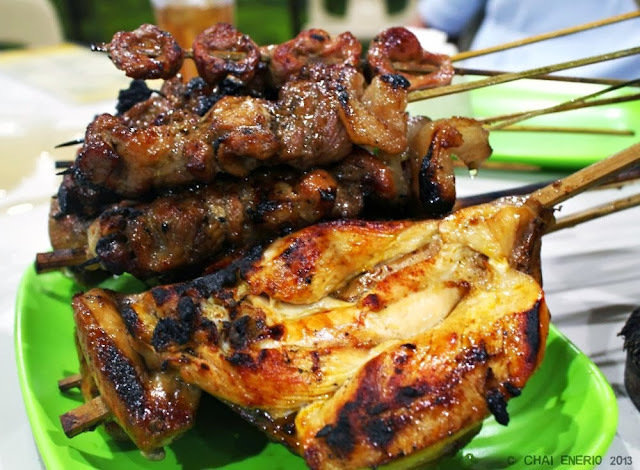 A visit to Bacolod would not be complete without the staple chicken “inasal” or barbecued chicken cooked the Bacolod way. I don’t know how they do it but the taste is completely different. I think it has to be the marinade that they use before cooking the chicken. The grill marks lent off a pleasant smoky taste and the chicken meat was really juicy and not at all dry like most barbecued chickens are. It was simple fare yet so delicious. We also had some barbecued pork meat but the chicken was the star of the night. 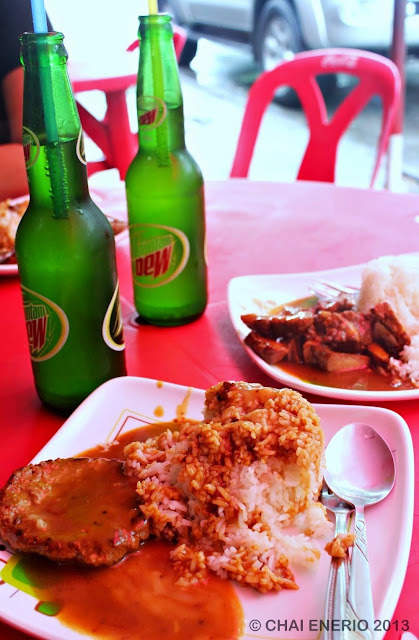 The next morning come lunch time we went out to get some friendly grub at the nearby La Salle school where right in front of it, there is a little cafeteria place that serves up pork chops, pork belly and burger steaks together with rice for an average of 60-80 pesos and that comes with a free bottle of Mountain Dew soda. Yeah! Simple eating pleasures but made even better with good friends to dine together with. 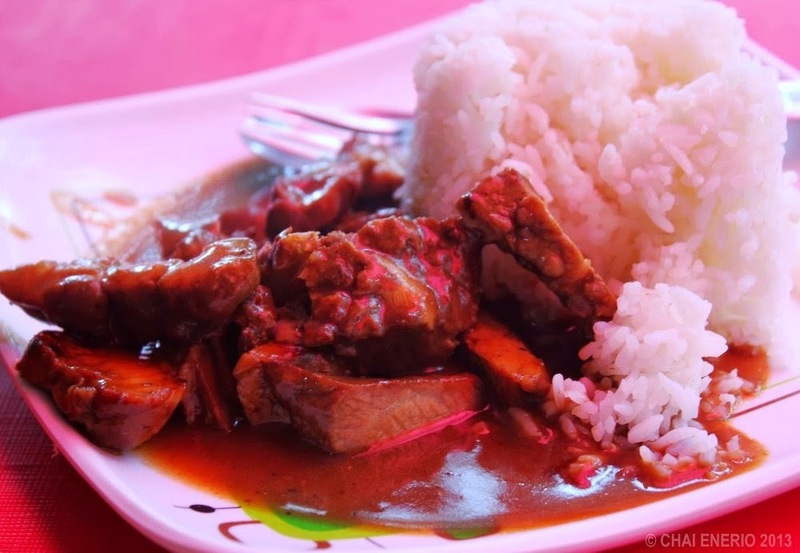 My last night in the “city of smiles”, they took me to a seaside eatery where the food was cooked ala carte and again the prices are insanely reasonable in this city. I love it here. 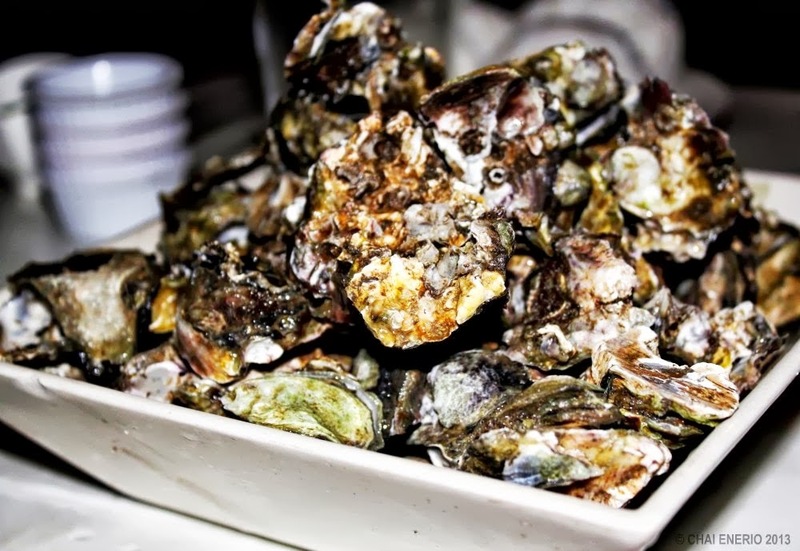 We ordered oysters and they just scalded them with boiling water and served together with some native lemon. The price for the oysters was like Php 50 for a basketful. We then had some sizzling shrimps just sautéed with some butter and lots of garlic. 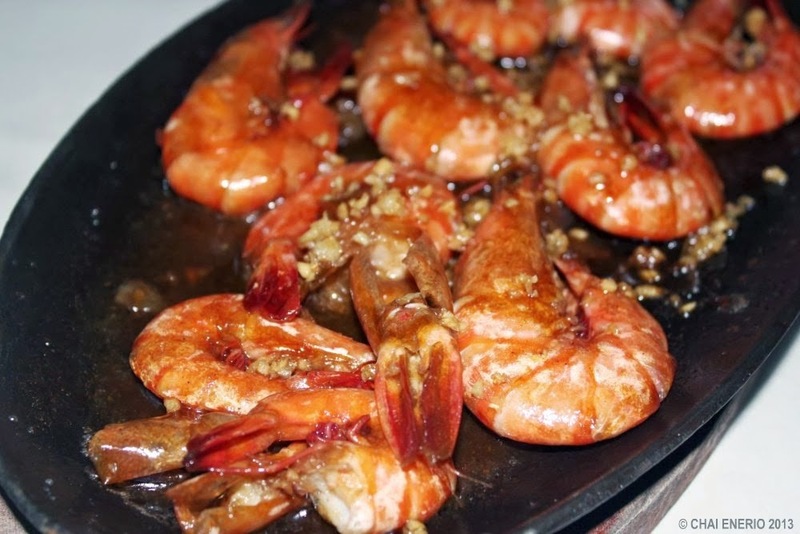 Average-sized shrimps cooked to a pinkish hue and loaded with garlic. Very simple but very yummy! 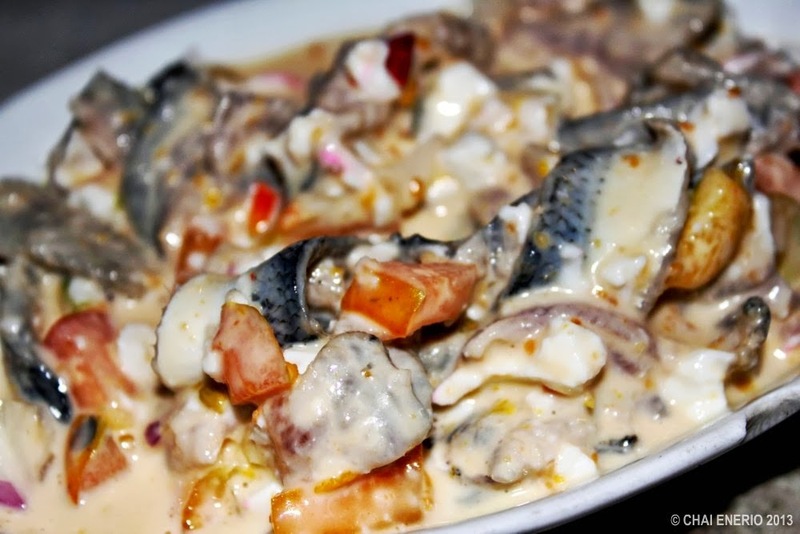 Our next order was some fish ceviche or more commonly known as “kinilaw”. Fresh slices of fish with the skin on and washed with some vinegar served together with some fresh tomatoes, ginger, garlic and a dollop of mayonnaise to make it even creamier. The sizzling squid came last. They were cooked well and did not have the rubbery texture associated with over cooking. 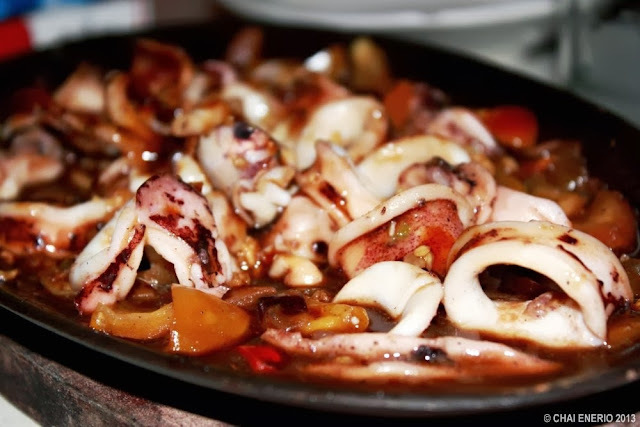 The squid was just sautéed with some spices, tomatoes, onions, and garlic in its own juices and it was good. 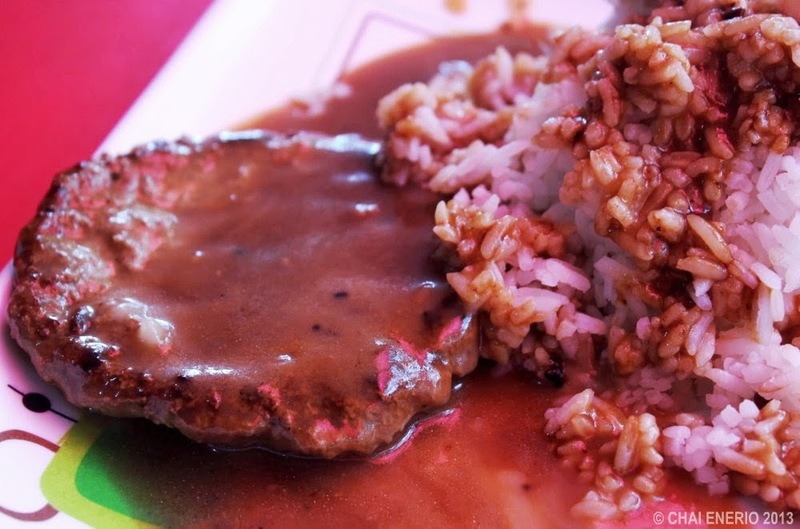 I had a great weekend in Bacolod full of good simple food and fun friends who shared with me the same love for food. Thanks M, H, and C. I can’t wait for the next trip since I still have a lot to try it.